We came here for peace and quiet and that is exactly what we got! Very cozy and private. Beautiful just Beautiful. We look forward to coming back very soon. Team was wonderful, everyone was so helpful and kind! I will be back to this cabin. 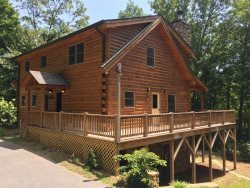 Our family likes to switch up and stay in different areas and cabins, but this cabin was everything we needed/wanted and more so we will be back to Smokey mountain high!! :) Cabin had all the amenities we needed and wanted and was a good price. To get away from everyday life. I love the fire pit -- one of the big reasons we chose this cabin. It was set so beautifully along the side of the mountain and I loved it. Shopping in Cherokee, and the deep creek trail head to see the waterfalls!! :) The views. Everywhere you look just an amazing beautiful view. Kathy and Kellie were very helpful and made sure we were able to find the cabin. The most pleasant stay we've had yet. Were lucky enough to be there when the snow came, it was beautiful and the [nearby] cemetery was very interesting with the old Civil War grave sites. Our son actually found our cabin . He looked for something close to the casino in Cherokee and something pet friendly and a nice view. He found the perfect cabin for us. The view outside the property was great. Pictures i made turned out wonderful. Between the fall colors and then the snow coming was outstanding. Staff and website was very efficient. Thoroughly enjoyed our stay and the beautiful mountain view and fall foliage from the deck where we would sit and enjoy drinks and conversation in the evening. The quality of the website and of the properties offered. Past reviews were also a major consideration. The staff was wonderful. Very knowledgeable and accommodating. We loved the cabin we stayed in. Very beautiful with wonderful views. The members of the team were great! I had to reschedule at the last minute due to a family emergency and the staff was very friendly and helpful with the entire process. My wife and I had a wonderful time. Met everyone of our expectations and we will stay here again! The staff was wonderful. Always a delight to talk to and always ready to help with any questions I had. No matter how many times I called I always got someone who was polite and easy to talk to. The cabin was absolutely gorgeous. It was the first time my parents had been to the mountains and they loved it. The kids loved walking through the mountains as well as the fire pit at night for roasting marshmallows. Can't wait to get back. The staff was wonderful to work with and willing to help me out. Other people I talked to, gave the expression that I was bothering them or they didn't have time to talk to me. Very friendly and helpful. We enjoyed our stay very much. The cabin was comfortable and in a quiet location. The weather was nice so we spent a lot of time sitting on the porch and looking at the scenery. Everything we needed was right there. Everyone I dealt with was extremely pleasant. Booked on the internet. Was very easy process. Beautiful cabin and view. Working with your team has been great, even when booking with such short notice. Everyone was polite and it was nice to hear them call when we had arrived at the cabin. We had an amazing time. The house is beautiful and it had everything needed for a relaxing getaway. Your website was easy to use and the cabins you offered were perfect for our needs. We were so impressed after our stay that I doubt we'll use anyone else now. A truly awe inspiring cabin. Fell in love with it immediately. Spent a wonderfully romantic time with the love of my life. We will be back. Our first trip to a cabin is a memorable one. In our stay here we have experienced scenic views, a wonderful town, and relaxation that is unattainable in our daily lives. Thank you.